A gray, smoggy sky over Salt Lake City inspired Doug Duschene to think twice about the pollution emitted from his fleet of landscape vehicles and equipment. After doing some research, Duschene learned that propane-powered machinery can reduce greenhouse gas emissions by 15 percent and carbon monoxide emissions by 40 percent compared with gas-powered equipment. 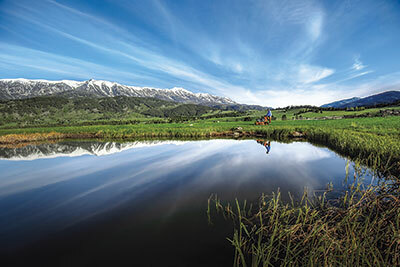 So prior to the 2015 season, the company converted 16 mowers—nearly its entire fleet—to operate on propane, becoming one of the first landscape companies in Montana to do so. Duschene used the Propane Mower Incentive Program offered by the Propane Education & Research Council (PERC), which gives a $1,000 incentive to applicants for each commercial propane mower purchase and $500 for each qualified conversion kit. In exchange, Duschene provides data to PERC that documents his propane equipment use at the end of each season. Bozeman Site Services provides 35 percent maintenance, 35 percent snow removal, 15 percent lawn care and 15 percent irrigation services to a 60 percent residential, 40 percent commercial clientele. Duschene shared with LM the top three challenges he faced when switching to propane and how he overcame them. The biggest challenge Duschene faced was accessibility to the propane needed to fuel his equipment each day. The closest fueling station was 10 miles from his facility. For Duschene, it didn’t make sense logistically to travel that distance daily. “Unlike gas stations, there are not propane-fueling stations all over the place, especially in small towns like Bozeman,” he says. As a solution, Duschene worked with his propane provider, Northern Energy, to have a 1,000-gallon propane tank installed on-site. He also leases more than 35 propane cylinders from them, and he negotiated low rental costs for the propane infrastructure and cylinders because of the high volume of fuel the company uses. Northern Energy also provided training to Duschene and his crews on how to operate and fill the tanks. This tactic has improved productivity because his crews spend less time refueling at gas stations because empty cylinders can be replaced in the field. 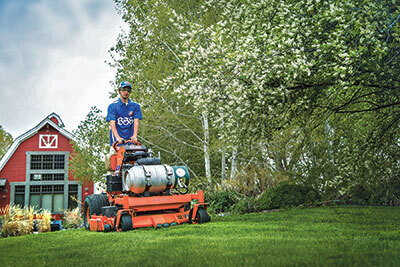 Figuring out how to service and maintain his new propane mowers was another challenge for Duschene because there were no local service technicians who had experience with these machines. After communicating this concern to his propane conversion kit provider, the company sent representatives to Bozeman Site Services to teach the crews how to properly service the propane mowers, and they are now able to do routine maintenance and repairs in-house. At the same time, since switching to propane, Duschene has seen his maintenance needs decrease. Because there is very little carbon in propane, the mowers don’t experience carbon buildup in the oil, which nearly doubles the lifespan of an oil change, he says. Before the switch, Duschene says he experienced ethanol contamination in his gas-powered trimmers and blowers, which required replacement of their carburetors once a year. “Our experience with what ethanol was doing to all of our other equipment helped us to choose propane as our fuel source, so our mowers wouldn’t fall prey to the same devastating effects,” Duschene says. “It was only a matter of time until we would have started needing to repair mower carburetors constantly, and we didn’t want that headache. Despite the time and effort Duschene put into making his propane dreams a reality, he acknowledges he was still skeptical that his propane machines would operate as efficiently and as powerfully as their gas counterparts. After experiencing ethanol contamination and hearing about the difficulties the automobile industry had trying to convert vehicles to propane, Duschene had a fear in the back of his mind that he could potentially damage his entire mower fleet. But after using the propane mowers, Duschene says they run as good as or better than gas-powered machines. In fact, his crews still run one gas-powered mower that wasn’t able to be converted to propane, and operators can’t even tell the difference.